Imbued by Cajun customs and pulsing with rollicking festivals, Lake Charles beckons travelers along Interstate 10 in southern Louisiana’s Acadian country. 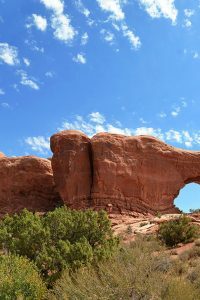 This historic town boasts warm temperatures year-round and is surrounded by exciting wilderness areas. In town, a vibrant Cajun culinary scene, live musical performances and a smattering of casinos fuel a dynamic spirit. Lake Charles sits on the banks of Calcasieu River about 30 miles north of the Gulf of Mexico. Interstate 10 runs right through the city, connecting it to New Orleans, a three-hour drive east, and Houston, Texas, about two and a half hours to the west. The weather here is generally warm, with cooler temperatures in January highs can climb into the 90s. 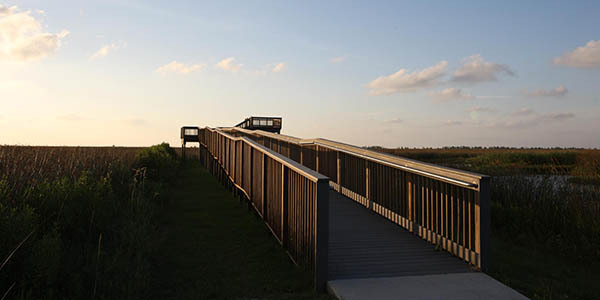 The Sabine Wetlands Park Nature Walkway. This area lives up to the Louisiana State nickname, “Sportsman’s Paradise.” Hunting is incredibly popular in the area, with deer, dove, rabbit and squirrel hunting habitats in great quantities. Hunters also can take aim at a variety of waterfowl, from specklebelly geese to mallards. Fishing in the Calcasieu River and surrounding bodies of water yield ample hauls of crawfish and shrimp throughout most of the year. Common freshwater species include bass, sunfish, catfish and trout. Lake Charles keeps guests entertained with gaming, sports and cuisine, but its biggest draw may very well be its strong Cajun culture. Download a map of the “Boudin Trail” to discover the wide range of spots that serve up state’s famous “boudin” snack sausages. Popular dining spots include the laid-back Hollier’s Cajun Kitchen and the snazzier 121 Artisan Bistro. Glitzy casinos entice gamblers, and both L’Aubrege Casino Resort and Golden Nuggets draw guests for high stakes action. Several places in town offer dancing, and the city’s famous Zydeco brunches introduce visitors to local musical stylings, while succulent Cajun cuisine gets served. Music and food play a central role in festival culture here. In August, Arts & Crabs festival salutes local culture with crab-based culinary delights. The Downtown Crawfish Festival is equally popular, with a beauty pageant, a parade, musical performances, and a crawfish-eating contest. Other celebrated events include Contraband Days, which features a reenactment of a pirate ship bombardment along with fireworks, boat races, carnival rides, and Cajun food cook-offs. The Black Heritage Festival offers a wide variety of traditional African-American and Creole foods. Lake Charles has a vibrant museum culture, with popular attractions for visitors of all ages. Families won’t want to miss the local Children’s Museum, which is chock-full of educational exhibits — including plenty of hands-on scientific displays — plus play areas for younger visitors. History buffs should check out the Historic City Hall, which often features traveling exhibits, or head straight to the Imperial Calcasieu Museum, full of colorful artifacts from across Southern Louisiana. Fans of American residential architecture won’t want to miss the Charpentier Historic District, a 40-block district in the city center, which is full of historic homes dating primarily from the late Victorian era. 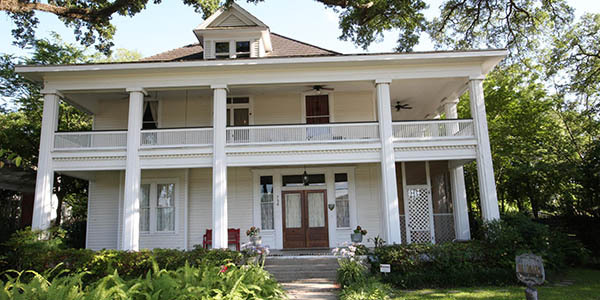 A home in the Lake Charles Historic District. Mardi Gras has been a fixture of Lake Charles since 1882, and though it waned in popularity by the middle of the 20th century, celebrations regained some of their original oomph by the 1970s. Today, Mardi Gras in Lake Charles attracts upwards of 150,000 people and is a popular alternative to the more raucous, and touristy, festivities in nearby New Orleans. Even if your visit doesn’t coincide with Fat Tuesday, you can still experience some of the glory at the Mardi Gras Museum, housed in an old schoolhouse. It’s allegedly the world’s largest collection of Mardi Gras costumes and ephemera, with a wide range of costumes and masks on display along with a festival float.